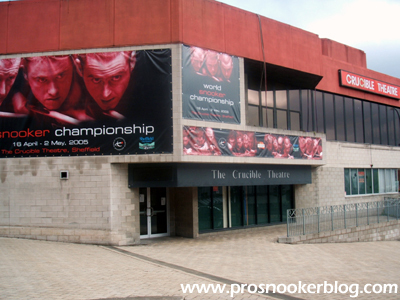 The upcoming 2014 World Championship marks not only the 38th time that the tournament will be staged at the iconic Crucible Theatre in Sheffield, but on a personal level, the tenth consecutive year that I will have been lucky enough to have been there to see snooker history made in person. Continue reading then for part one of a three part series comprising an unashamedly personal trip down memory lane, as I recall some of the moments that have stuck in my mind over the years, both as a star-struck fan and in recent years a media room blogger. From an early age growing up in the early 1990’s, I had always had an interest in snooker. Indeed somewhere there is a photograph of me with a very small table that my mother bought for me one Christmas, so the signs were there early on. While that was about the limit of my playing days, I would always tune in to watch the snooker on the television, with memories of the World Championship and particularly the finals in the late 1990’s such as John Higgins’ victory in 1998 sticking out, while Stephen Hendry and Ken Doherty were the players that earned my support. It was not though until 2005 that the opportunity first arose for me to consider going to watch the tournament for the first time. 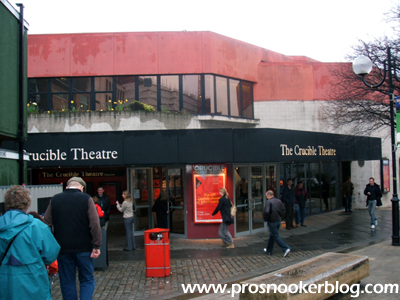 18 years old and coming to the end of my first year at University, I had enough money saved up from my student loan to spend on tickets and the local Premier Inn to be at the Crucible myself for the first time. 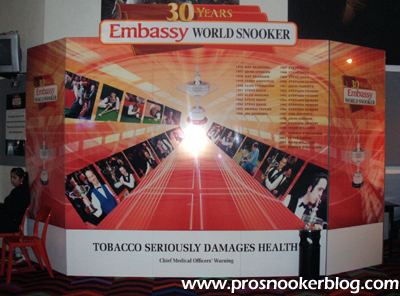 What is important to remember however is that at the time, it was not only set to be the 30th and final World Championship to be sponsored by Embassy, but the widespread belief was that it might be the last time that the event would be held at the Crucible Theatre. Because of that, I made certain to have tickets to watch the big names at the time, including Hendry, Doherty, Higgins, Williams, Hunter and more, if nothing else so that I could say in the future that I had seen these great players, who I had watched on television for as long as I could remember, in person. 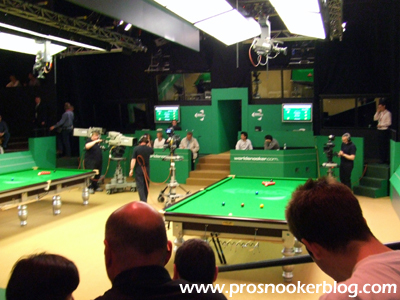 The photo below was taken on the opening morning of the 2005 tournament, the first time that I had seen the famous theatre and of course prior to the refurbishment that would take place a few years later. Looking back, at the time Sheffield had the feel of a giant building site and a city going through it’s own wider refurbishment, but while the landscape and surrounding area has changed a lot over the years, one thing that hasn’t is the famous arena itself. With it’s iconic twinkle lights, that for me were probably the single most distinctive feature of the venue as a TV viewer, the first impression that I had was of just how small the venue feels. Whenever I meet anyone who is visiting the Crucible for the first time, generally their first comment is the same. It has become something of a commentary cliché to say that watching snooker at the Crucible is like watching snooker in your living room, but even five or six rows back you are so close to the action that it really does feel like that! With the much-missed classic snooker tunes booming out prior to the start of the tournament’s opening session, I settled in for what would prove to be a brilliant nine frames between defending champion Ronnie O’Sullivan and Stephen Maguire, not a bad start for my first ever session of live snooker. 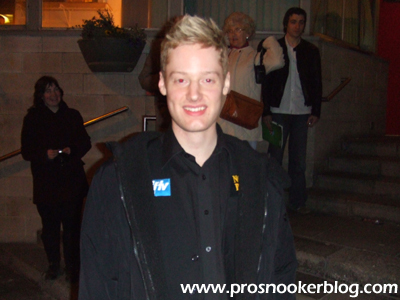 The other thing that struck me during my first day at the Crucible and something that would ultimately play a part in my decision to start this very blog was how accessible the players were, in terms of being able to catch them for an autograph and a photo at Stage Door. In particular, one player impressed me more than any other during that day and that was Paul Hunter, who was in action against Michael Holt, just weeks after he was diagnosed with cancer. While he could have been forgiven for wanting to keep a low profile, he must have been out at Stage Door, laughing, joking, standing for photos and signing every autograph for over 20 minutes. Though I would never meet Paul again, it was impossible not to take a shine to him and clearly that is reflected by all of the comments that I have read from those who knew him. 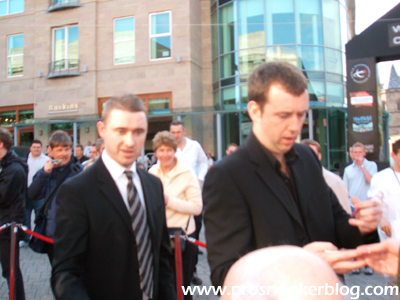 Another great personal memory from the tournament was that I was lucky enough to see my first ever live 147, on only my third ever day of live snooker, as Mark Williams completed a 10-1 victory against Robert Milkins in the best possible way. Not being the best at maths, it took me a while to realise that the break was on, I seem to remember thinking that he was on a 146 for quite a while, before the reactions of the crowd gave the game away. As well as being quick enough to get my camera out and take a photo as the crowd gave Mark a standing ovation, I also remember being able to race around to Stage Door and get his autograph onto my increasingly collectible programme. Perhaps the most significant moment of the fortnight though would come on the first Friday, midway through what I recall was the second session of Stephen Hendry’s second round victory against Anthony Hamilton. 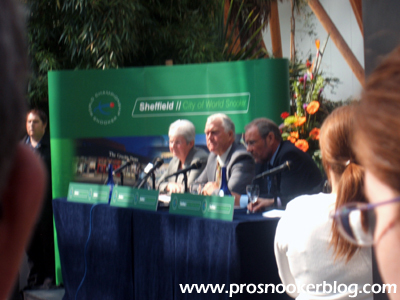 With speculation rife as to the tournament’s future, it was announced at a special press conference at the city’s Winter Gardens that the tournament would remain in Sheffield for the forseeable future. One man present at that press conference was Shaun Murphy, and it was the Magician who would go on to make it as far as the final, where the qualifier would face Welshman Matthew Stevens. Though Stevens had led the final at various stages, it was ultimately Murphy who would prevail, though I should have been safely tucked up in bed with a university exam to sit the following morning. It was one of the great finals though, not just for the action on the baize, but the atmosphere around the venue beforehand, with almost all of the greats returning for a special photocall in the arena ahead of the final session of that last Embassy World Championship. To think that night I was able to meet the likes of John Spencer, Joe Johnson, John Smyth, David Vine, Ted Lowe, Ray Reardon and Cliff Thorburn is something that remains very special to me. Overall it was tournament that remains right up there as one of my favourites on a personal level, due to the moments listed above, but also several others that I haven’t mentioned such as waiting outside at around 1am for an autograph from Ronnie O’Sullivan one night, knowing that he was in for a late night practice, or that match when Michael Holt famously miscounted the score against Steve Davis during what was a riveting second session. And let us not forget those protesters who ascended the building dressed as Batman and Robin armed with a bottle of Tango. 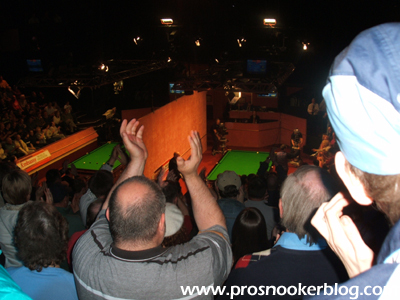 I was so taken in by my first year at the Crucible that for 2006 I was able to acquire one of the now much-coveted season tickets, one that was in an excellent spot on row C behind the players on table two and would all but become my home for the subsequent fortnight. 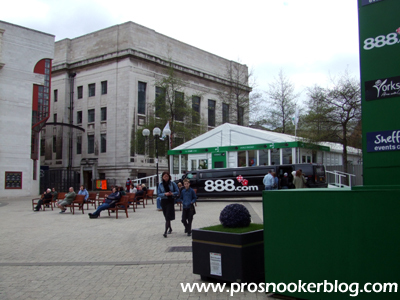 Walking through the doors on the opening morning of the tournament for the first session of the match between Graeme Dott and John Parrott, I remember the feeling of horror as I saw the green set brought about by new tournament sponsors 888.com, which it is fair to say was not to my liking! My other abiding memory from the day’s opening match was of a ringing telephone from somewhere up high in the arena, which prompted a quip or two from the ever-sharp Parrott as to who the mystery caller might be. 2006 was also the first year of the large marquee in Tudor Square, which would comprise the Cue Zone where a lot of the TV work could be recorded, though the main benefit for the fans was providing another useful place to hide for shelter from the Sheffield rain. Gone though was Roger Lee’s popular Heritage Room, replaced by corporate hospitality for the tournament sponsors and something that to this day remains a real loss for the tournament and those with an interest in the history of the game. Stand out moments of course included Nigel Bond’s epic 10-9 victory against Stephen Hendry on a re-spotted black (my blue and white t-shirt with ‘the maestro’ on proving more of a curse than a source of good luck), while Graeme Dott’s semi-final victory against Ronnie O’Sullivan, culminating in O’Sullivan giving away his cue to somebody in the crowd also springs to mind. Mark Selby showed signs of things to come in later years as he stunned tournament favourite John Higgins with a convincing victory in the opening round, before he lost out at the last 16 stage to former champion Mark Williams. The most bizarre incident from that match however occurred when those inside the venue were evacuated due to a fire alarm. I remember feeling rather uncomfortable as the crowd over on table one made a swift exit from the arena, while those of us on table two were left to watch, unaware of what was happening before play was subsequently halted mid-frame and we were also asked to leave. 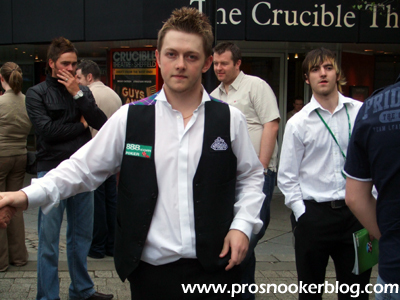 As during the previous year however, one of my strongest memories from the tournament was to involve Paul Hunter, who made what would prove to be his final appearance at the Crucible against Australia’s Neil Robertson. Unlike the previous year where Paul was still outwardly in good spirits, the effects of his battle during the previous month were plain to see for those in the arena. He visibly struggled physically, for example to picking up his cue extension from the under the table and it was both heart-warming and harrowing in equal measure to see him bravely battling on. Never have I wanted a session of snooker to end so quickly, I found it to be deeply uncomfortable and I remember speaking to Neil shortly afterwards who himself had clearly found the match to be a difficult one to play, notwithstanding the photograph above. Generally speaking however, my memory of the tournament was that it was one of relatively low quality, something borne out by the fact that ‘just’ 46 centuries were compiled during the event, the lowest since 1997. Following two tense semi-finals, the final between Peter Ebdon and Graeme Dott would prove to be a real grind, one notorious in the minds of snooker fans for both its late finish and lack of big breaks. Despite that, Clive Everton recently told me during a Twitter Q&A that he would place the match right up there among his favourites and there is no doubt that the match was a fascinating one as Ebdon looked like he might complete a memorable comeback, before Dott got over the line. Either way, there is no doubt that Graeme was a deserving world champion, indeed anyone who can record a session whitewash against Ronnie O’Sullivan in a Crucible semi-final deserves everything that comes their way. 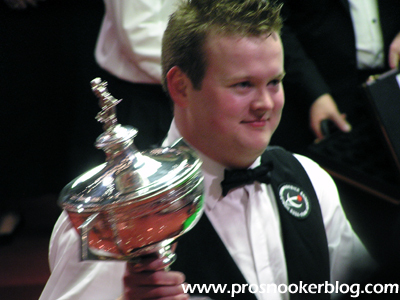 Though 2007 saw a return to the Crucible winner’s circle for John Higgins, following a nine-year drought dating back to his first world title success in 1998, this year saw débuts for a number of players who are now firmly entrenched inside the top 16. While Ding Junhui and Judd Trump were both to lose out to former world champions in the form of Ronnie O’Sullivan and Shaun Murphy respectively however, Northern Ireland’s Mark Allen was to produce a brilliant display to defeat 1997 Crucible king Ken Doherty 10-7 on his first appearance. 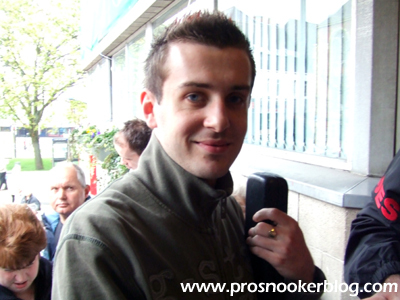 What struck me in particular from that match was not Allen’s talent, which was no secret in snooker circles by that point, but the confidence and demeanour that he had around the table from the very first frame. He showed no fear against such an experienced opponent as he opened with breaks of 92 and 95 on his way to an opening session lead. 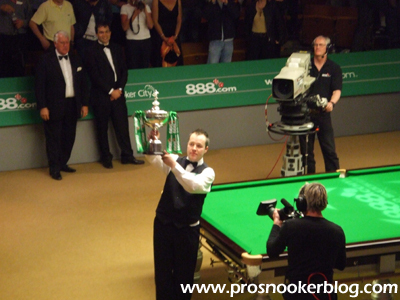 Perhaps more tellingly though, I remember thinking when Doherty drew level at 7-7 with a brilliant break of 135 that he had got his man, only for Mark to respond with three half-century breaks to win the next three and complete what to this day remains the most impressive Crucible début that I have seen up close. 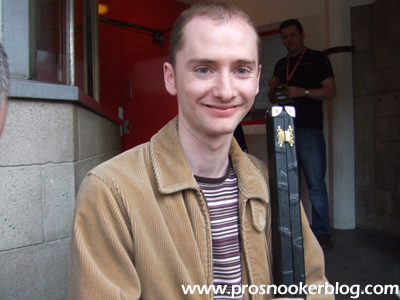 As I mentioned above at the top of the article, Stephen Hendry was always a hero of mine and one stand-out memory of mine came immediately following the conclusion of his comeback victory against David Gilbert in the first round, when I was able to get Hendry’s signature on a copy of his autobiography before he had even left the arena. If anyone remembers the opportunistic spectator reaching across the hoarding and getting him to sign something as he left the arena, yes that was me as he signed the book above. My attempts to have a photograph with him were defeated however, as the random spectator who I tasked to take a photograph as I posed with the seven-times world champion decided not to press the big button on top of the camera. Just my luck! As it would turn out, Hendry would ultimately fall at the next hurdle to the improving Ali Carter, who in turn lost out in a decider to the real breakthrough player of the tournament and eventual runner-up Mark Selby. Having won his first match at the venue a year previously against John Higgins, Mark would go on to defeat Stephen Lee, Peter Ebdon, Carter and most dramatically Shaun Murphy 17-16 to climb into the top 16 and set up a Crucible clash with Higgins for the third successive year. Though Selby was to come back strongly at Higgins from 12-4 down during the third session, he was not able to deny the Scot that second Crucible crown, one that felt long overdue given his dominance at times towards the end of the 1990’s. One of my dream: to be sitting at the front line of the Crucible, watching Marco Fu playing. I have never been to Europe, let alone UK.